Use the guide below to find your perfect combination of coffee and chocolate, while supporting farmers across the world. 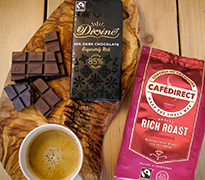 Whether it’s something rich from hills of Kilimanjaro balanced with something sweet from Malawi, there’s an array of indulgent flavours to discover by pairing Cafédirect and Divine Chocolate together. Both brands are independent Fairtrade companies and farmer-owned, so you can be confident farmers are getting a fairer deal. They work directly with farmers to ensure the very best quality ingredients are grown with care and the farmers get a greater share of the wealth they helped to create. 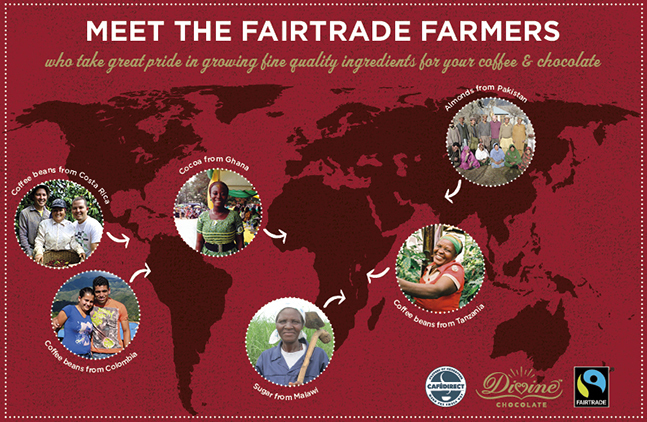 So you can enjoy your cuppa and sweet treat, knowing your purchase empowers farmers to improve their livelihoods. A bold and intense match, the full flavour of the coffee brings out the complexities of the cocoa–rich chocolate. Not for the faint-hearted! The toffee & sea salt compliments the smooth rounded finish of the medium roast. Both are strong, smooth and sweet and the result is splendid! 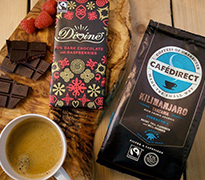 In Tanzania, Cafédirect work with farmers located all around the country, in particular the Kilimanjaro Native Co-operative Union, located in Moshi, 580km north west of the capital Dar-es-Salaam. They have 61,000 smallholder coffee growers farming the fertile volcanic soils on the slopes of Mt. Kilimanjaro. 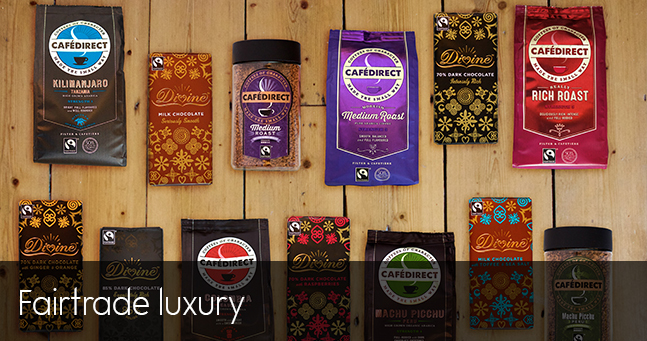 Cafédirect have been partners with KNCU, Africa’s oldest co-operative, since 1994 when they launched their Medium Roast instant coffee. KNCU’s expert coffee growers work long and hard to nurture the high quality Arabica beans that you taste in every cup of our Kilimanjaro coffee. Coffee plants are grown in the fertile volcanic soils on the slopes of Mt. Kilimanjaro, Africa’s highest mountain, in the shade of banana trees. This allows the beans to mature more slowly and natural sugars increase, enhancing the flavour and resulting in a lively, deliciously aromatic and intense coffee. 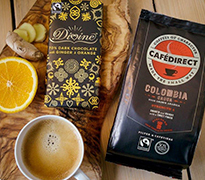 Colombian coffee is known as one of the best tasting coffees in the world and our grower partners, Cosurca, are a co-operative of 1,300 smallholder growers from a region particularly renowned for its coffee – the Cauca region, in Southern Colombia. COSURCA was formed in 1993 with sponsorship from the UN to support alternative crops to cocoa and offer farmers the chance to improve their livelihoods by producing high quality coffee instead. The distinct quality of the coffee comes from a unique combination of factors such as the favourable climate, the rich soil, the variety of coffee trees and ultimately the hard work and commitment of the coffee growers. Having our prized Colombian coffee grown with such passion, care and dedication, we are confident that your cup of coffee will have the best taste and quality! Kuapa Kokoo is a co-operative of over 80,000 small holder cocoa farmers in Ghana. 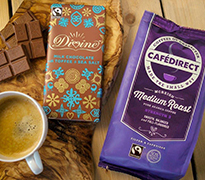 They are Fairtrade certified and also own the largest share in Divine Chocolate, 44% to be exact. Meet Esther, a cocoa farmer and member of Kuapa Kokoo. 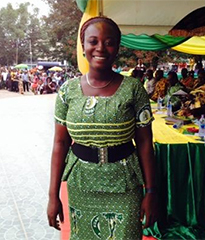 She is a Recorder in her society and is also an elected member of Kuapa's National Executive Committee. Her favourite bar is White with Strawberries (which has her story inside the wrapper!). She visited the UK recently to celebrate Chocolate Week, including a visit to Waitrose head office. She described how they care for their trees, pick and break open the cocoa pods, then ferment and dry the beans. These stages need care and cannot be hurried to ensure best quality cocoa. 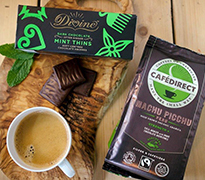 All the Fairtrade sugar in Divine comes from Kasinthula Cane Growers Association in Malawi. KCG is a smallholder sugar cane project located in the in hospitable Shire River Valley District of Chikhwawa in the south of Malawi. Long droughts occasionally result in famine and the twice-yearly rains frequently bring floods. Most families make a living out of growing maize, cassava or rice on the arid land, while others earn cash from sugar cane or cotton or work on nearby sugar plantations. Poverty is rife with most people living in very basic mud huts and few able to afford to keep livestock. Kasinthula has developed a new business model so that all farmers can understand the costs of inputs, labour and irrigation of their plots.